January is not the easiest month of the year to maintain your health and fitness! It’s cold, dark, the days are short, and there are a million other excuses for hibernating in your family room with your pyjamas on. 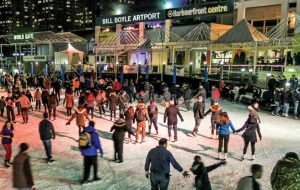 Luckily, there are some fantastic event planners in Toronto who understand what Torontonians need the most at this time of the year: a reason to get bundled up and get outside for some fun, fresh air, and fitness! It’s a fun and social way to enjoy the winter, and a 150 pound woman can burn approximately 500 calories in an hour of moderate ice skating! There are some great (and FREE!) ice rinks in Toronto, and skate rental costs less than two cups of coffee or a netflix movie! Free ($8 for skate rental). 235 Queens Quay W., harbourfrontcentre.com.